Carbon monoxide (CO), the “silent killer” is an odorless, colorless, tasteless, non-irritating gas that can severely affect humans within minutes of exposure. The symptoms can include nausea, vomiting, dizziness, shortness of breath, tightening of the chest, confusion, and prolonged exposure can lead to death. CO often kills people at night, when they are sleeping and cannot detect or respond to the symptoms. The Center for Disease Control and Protection (CDC) estimates that 400 Americans die annually from carbon monoxide poisoning. Hence, laws in the state of Washington require all homes to be equipped with functioning carbon monoxide detectors – devices that have literally saved lives. Carbon monoxide is emitted when fuels like gasoline, kerosene, wood, coal, oil, propane, and natural gas are burned. Most home have CO-producing devices in them: furnaces, generators, heating systems, gas stoves, and other appliances. The World Health Organization recommends that levels stay below 25 parts per million (ppm) for any one-hour period of time, and below 9 ppm for any eight-hour period. How can CO levels increase to unsafe, even fatal, levels? Malfunctioning, improperly installed, or misused appliances and equipment can be the cause. For example, if a homeowner uses an outdoor grill inside, there’s a greater risk of the CO levels increasing within the home. Furthermore the carbon monoxide accumulates faster if the home is well-insulated. 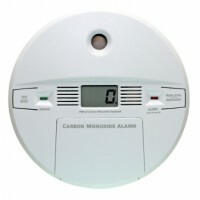 As of Jan. 1, 2011, contractors must install CO detectors in new single-family homes and residences, including apartments, condos, hotels, and motels. As of Jan. 1, 2013, all existing single-family residences etc. are required by law to have working CO detectors in place. When selling a home, the owner is required to install CO detectors before the new party can move in. Combination smoke/CO detectors are allowed under the law, but there are also CO detectors that plug in to outlets. The CDC recommends using battery operated or battery back-up detectors, and to check battery life twice annually, when Daylight Savings Time begins and ends. In the immediate vicinity of every bedroom. On every level of a residence. Vent all gas appliances properly; ensure horizontal vent pipes are not perfectly level. Do not use portable flameless chemical heaters indoors and never use a gas range or oven for heating purposes. As of now, Washington does not require commercial buildings to install CO detectors. Some states, such as New York and Maine, are lobbying for expanded regulations. The laws may change, but for now, residential property owners need to make sure they are in compliance. For more information on protecting against CO poisoning, consult the CDC at: http://www.cdc.gov/co/faqs.htm.